1. Go to your subject's page and click on the FamilySearch icon under the profile. This expands the FamilySearch menu. Select "Download more generations." This will take you to the import screen. 2. 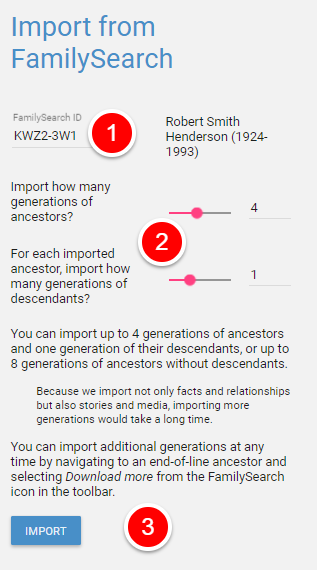 Select the number of generations of descendants and ancestors you wish to import. Three generations of descendants can include more than 800 people. That's a lot of new people. You can import up to 4 generations of ancestors and one generation of their descendants, 3 generations of descendants with no ancestors or up to 8 generations of ancestors without descendants. Because we import not only facts and relationships but also stories and media, importing more generations would take a long time. You can import additional generations at any time by navigating to an end-of-line ancestor and selecting Download more from the FamilySearch icon in the toolbar. If you want to download more than 3 generations of descendants, you will need to do several downloads from the end of lines. Item 1 is the FamilySearch ID of the root person in your download. Item 2 is where you choose how many generations to download. Item 3 turns blue after the root person is selected and the number of generations is chosen. Click on the Import button to begin. 4. Just a note. When you import people from FamilySearch they are already matched to their FamilySearch counterpart. We use those matches to prevent duplication. If you have added people after your initial import, please take the time to match them to their FamilySearch counterparts (if any) to avoid duplicates. Scroll all the way down to the "Parents and Siblings" section. 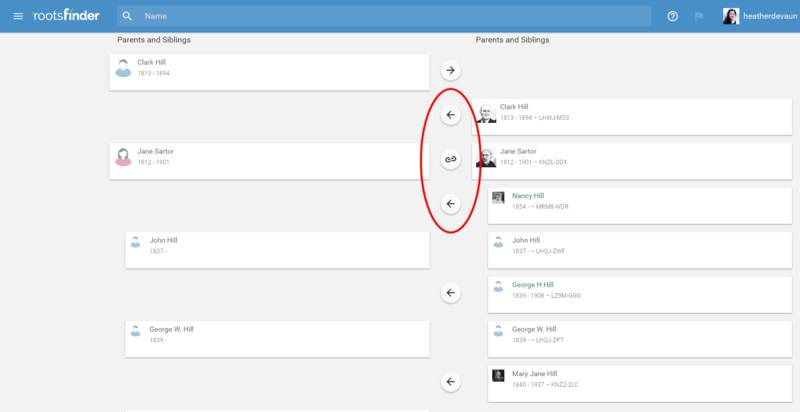 Here you will be able to quickly link existing family members if you find a suggested match for them at FamilySearch. It is also a good idea to inspect the FamilySearch tree before download. FamilySearch has a lot of duplicates. Many are duplicate spouses with duplicate children. Sometimes there are several duplicate families in a tree. You have two options. You can clean up the FamilySearch tree and then download it into your RootsFinder tree. The more expedient method, is to them anyway and eliminate the duplicates in your tree. With the second option, it will save time if you click on People in the left side menu. Then, you can see the duplicate names next to each other, pick the one you want to save and delete or merge the duplicates. We use the FamilySearch matches to prevent duplication. If you have added people to your tree that are not matched to FamilySearch, it's a good idea to match them to their FamilySearch counterparts before importing additional generations from FamilySearch. You tree is likely connected to thousands of people you are unaware of. Downloading all the connected people at once would make your tree unwieldy. A mere three generations of descendants can include more than 800 people. That's a lot of new people. You can import up to 4 generations of ancestors and one generation of their descendants, 3 generations of descendants with no ancestors or up to 8 generations of ancestors without descendants. Because we import not only facts and relationships but also stories and media, importing more generations would take a long time.